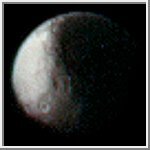 Iapetus [eye-AP-i-tus] is one of the stranger moons of Saturn. Its density is similar to that of Rhea, indicating that it has a small allotment of rocky materials. Its leading side is dark with a slight reddish color while its trailing side is bright. The dark surface might be composed of matter that was either swept up from space or oozed from the moon's interior. The real reason is still unknown. The dark material might be a thin layer of organic material perhaps similar to the complex substances found in the most primitive meteorites. However, there are no bright rimed craters present on the dark hemisphere. If the dark material is thin, it must be constantly renewed since a meteor impact would punch through the layer to reveal brighter surface material. The dark material may have originated from Phoebe, which has a very low albedo. Micrometeor impacts could kick dark matter off Phoebe which is then swept up by Iapetus. 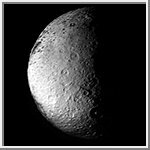 (Phoebe, however, has a slightly different color from that of the dark surface of Iapetus.) The fact that the material is on the leading hemisphere seems to support this theory. On the other hand, the dark material seems to be concentrated in crater floors. This would indicate an internal origin. 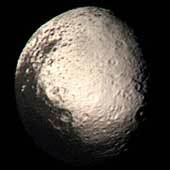 Since Iapetus is so far from Saturn, it may have formed with methane or ammonia ice in its interior. The dark material could be explained by eruptions of methane from its interior. 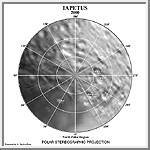 This theory is supported by a dark ring of material about 100 kilometers (62 miles) in diameter that straddles the border between the leading and trailing hemispheres of Iapetus. Such rings formed on the Moon and on Mars when dark volcanic material flowed into impact craters and filled around the central peak.